This is my most elaborate sculpture for 2007. It stands more or less 6 feet tall, depending on how you bend the upper part of the plant. It represents a California giant kelp plant (Macrocystis pyrifera) from the top of the ocean all the way down to the sea floor. Swimming around the plant are bright orange Garabaldi, the state fish of California. This shows the yarn and fibers used to make the kelp blades. 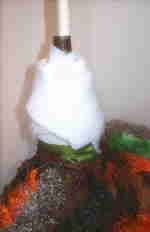 The yarn is sandwiched between layers of Solvy (a water soluble stabilizer) and pinned to hold it in place. Each blade is free motion stitched on both sides with gold metallic thread and variegated green thread. Then, wire is satin stitched to the perimeter of the blade for stability and so it can be shaped. In case you're wondering, the most blades I was ever able to make in one day was 10, and that was only because I stayed up until 3 in the morning working on them. My sewing machine and my neck were much happier when I only made 5 the next day! 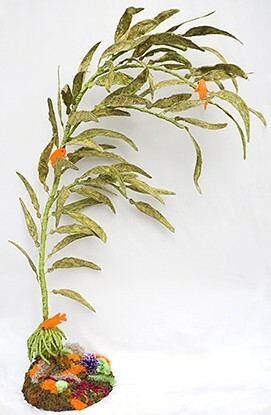 This image shows the how the wire of the fronds is attached to the stem and how the stem is wrapped with the final covering fabric. 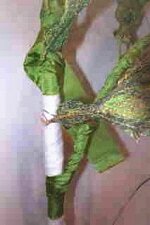 I used a taffeta fabric in a spinach green color for the stems and the holdfast. This shows the a portion of the base where the pipe is attached for the stem of the plant. Batting is wrapped around the pipe to form the shape of the the holdfast. The holdfast is the kelp plant's equivalent to roots except that there is no soil for the holdfast to anchor to. Instead, the holdfast grabs onto rocks or whatever it can to hold itself in place. This is what the main stem and one of the lower stems look like in different stages. The main stem is wrapped with batting. The lower stem is still bare wire. It is wrapped with batting and then the individual kelp blades are attached. Finally the whole thing is wrapped in the green covering fabric. And after working with all that wire, my hands and arms are covered with scratches. Of course, I did get a great upper body workout trying to bend that heavy wire. So, how many hours are in this piece? I really don't know, I wasn't counting. I do know that is was enough hours that I have had a couple of dreams of kelp and I have been seeing green lately. I know there are about 40 hours in just the base alone. In the end, I guess it really doesn't matter to me how long it took. I really like the way it turned out and I am looking forward to doing other similar pieces.